This is the photo currently circulating in the world-wide web. 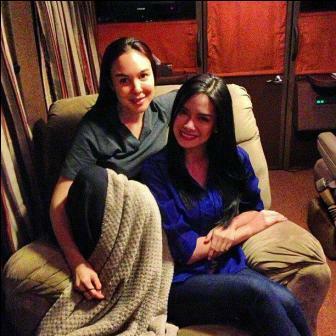 The photo shows Gretchen Barretto and Erich Gonzales! They say that Erich and Gretchen will reunite in the hit Kapamilya superhero fantaserye "Juan Dela Cruz." If that's the case, then what do you think will be the role of Gretchen in the said TV series?! Will she be another aswang?! Gretchen and Erich played half-sisters in the 2010 hit drama series "Magkaribal." This will be a very exciting reunion of these two phenomenal actresses if prosper. Gretchen will also reunite with Albert Martinez. Gretchen and Albert portrayed the characters of queen and king in the recently concluded "Princess and I."